Purchase a "1 Hour Sponsorship"
SPONSOR AN HOUR, SEE THE SHOW, BE ACKNOWLEDGED! 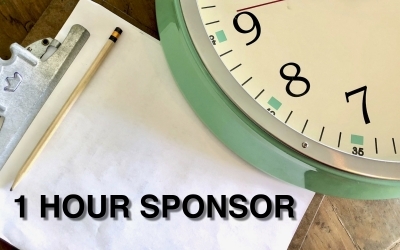 We need sponsors for the event... so why not have a different sponsor for each hour? For only $60, you get 2 complimentary tickets to attend the event, and a full hour of acknowledgement on social media via our live feed or photos/videos during the time you are sponsoring. We will also update our sponsors here on our website and on Facebook as the hour sponsors are purchased! HOW DO I PURCHASE A SPONSORSHIP? To make it easy on you, we are putting a purchase button here! Simple order your sponsorship for the time you want, and we'll get in touch with ticket details. PSST! If you choose the midnight hour, you actually get 7 hours of sponsorship for $60! All other times are available on the hour every hour from 7pm on September 21 to 9pm on September 22. Questions? Want to pay in person? Contact us at info@betheatre.com!